If you care to manage, store documents and create content in the office you know that efficiency is everything. No matter what you’re doing, it is important to seize the moment. Sometimes there are emergencies that cannot wait. Corporate crises are always ready to land on you, and break out over a little unsolved detail and create a catastrophe. To avoid disasters, it does not take much: the workflow has to roll in an orderly manner and without obstacles. Behind this process, however, there are people that are not always found in the office, key figures who at the time of need, are at a meeting to promote the brand of the company or have faced sudden difficulties. How do you deliver that document to be signed for an important agreement? Or that quote that means gains and future investments in other projects? There is a solution and it is the Big G that gives this to you on a silver platter, fulfilling your needs. All you need to live better in your job and your life is often close to you, before your eyes, you have to just look to the world’s most famous search engine. Need to edit a document, and you cannot use the company DMS? Well, there’s Google Drive, an online platform that is always with you, on PC and mobile devices. With this resource you will have the office in your pocket everywhere, overcoming the limits of space. Italy, on the other hand, seems to love this particular type of service: in a Eurostat report of 2014, the Beautiful Country is in second place for the number of companies using cloud computing. You’ll see, you’ll love Google Drive. I can not help it. Here’s what you need to know to use it in the office and increase productivity. And tomorrow the way you do business will change for the better. You do not believe me? Read on. I will not use technical terms to explain what Google Drive is. Try to imagine this service as a pen drive attached to the web. A space of 15 gigabytes free (to get more space there is a fee) where you store your documents, images, graphics, presentations, spreadsheets and text calculations to questionnaires and surveys. The saved files are organized in accessible folders and editable by anyone with permission, and internet connection. But not only that. Projects can be shared with colleagues in real time and opened from any device: PC, smartphones and tablets, through a Gmail account. I use Google Drive webwriter in my work and I am not afraid to write at the other side of the world or if my PC is broken. If I just have a connection, I have everything I need in one place. In short, a perfect tool for peace of mind, a fellow worker who will never betray you. And it’s free, what more do you want from life? I know, now you know how it works. There you are satisfied. It is very simple, let’s start from the beginning. Connect to the Google home page, you see that heavenly button at the top right that says “Sign in”? Well, click it. After this, you open a page in which you will write your name and password for your Google account. Or if you do not have one you will be asked to create one. With the Chrome Omnibox, or through using your browser’s address bar. With the grid that appears on every page that supports Google services. Then, place the pointer on “Drive” and click. You’re in? Perfect. This storage platform fully reflects the Google style: simple, neat, colorful. In the left column there is a directory of Drive folders. About the folders, you can create these by clicking on the “New” button or alternatively you can upload them from your PC. Also, at the top there is the field dedicated to searching internal files below is the toolbar. On the right materializes another column that you can use to find the details concerning the documents. Such as the several changes you’ve made to a job over time. To create a file in Google Drive always go to “New” and select the format you want. Want to write? Go to “Google Docs.” A blank page, ready for use opens in a new window. You can give it a title, edit it and share it if necessary. In short, all the options available to you – the type of font, line spacing, bullet – they have nothing to envy from Office. Indeed you will forget it in a hurry. I almost forgot. With Google Drive you can also add useful links and comments to give suggestions to colleagues. When you’re done you can move the content into a dedicated folder. I know what you’re thinking: “What if I want to upload a document“? You can do that easily, go to the “New” button and then under “Upload files”. The latter is visible from a new window. Now what you need is in Drive and after a few minutes it will be synchronized with all other devices. As I mentioned, synchronization means that all changes made to your laptop are saved on your computer in the office. On your return you can pick up where you left off. A few formats are incompatible with this online platform. For example: video and compressed archives. And in any case, these elements can be saved and shared but not opened and edited. The ease with which Google Drive allows the sharing of content makes it a perfect tool for companies. Simple, fast and promoting collaboration between colleagues. To share a text document or calculation just copy the link of the content, or click the “Share” button at the top right. Then, enter the Google Account of your employee who gets notified via email. If approved, your partner can work on your content in real time and communicate with you via chat. There is also a version of Google Drive for business but there is a cost to be incurred: 8 euro per month for each account, the space is unlimited and customization is at the maximum. I’m talking about Google Drive for Work that gives you a chance to secure your documents through encryption. Let me tell you briefly the experience of Alpitour. Google Drive has improved the communication of the group dedicated to the organization of trips. The cloud tool of Big G has increased the collaboration between groups. So much so that they have 4 vacant rooms dedicated to video conferencing. The Alpitour employees prefer Google Hangouts, the Google chat app to share a Google Drive document. To learn more check out this article. Give folders a color: You want to immediately locate the document you need? Change the color of the folder that contains it. So it stands out immediately. There are 24 colors Let’s see how you can put this trick into practice. Right-click on the folder name and choose “Change Color.” A few moments and you’re done! Choose the order of the files: this remedy helps you increase productivity. At the top right there is an icon with two letters in block, “A / Z” or “re-ordering options”. Afterwards a drop-down menu appears where you can select the order you prefer: alphabetical, last modified, last modified by me, recently opened by me. Creating forms: with this solution you can create contact forms, surveys and draw up a spreadsheet to manage a mailing list. To access this option click on New, Other, Google Forms. Now you just have to select the template and write the questions. In this small guide for Drive I wanted to explain how to use this cloud computing platform. It is the ideal solution for your job management and document archiving. Now I leave the final word to you. 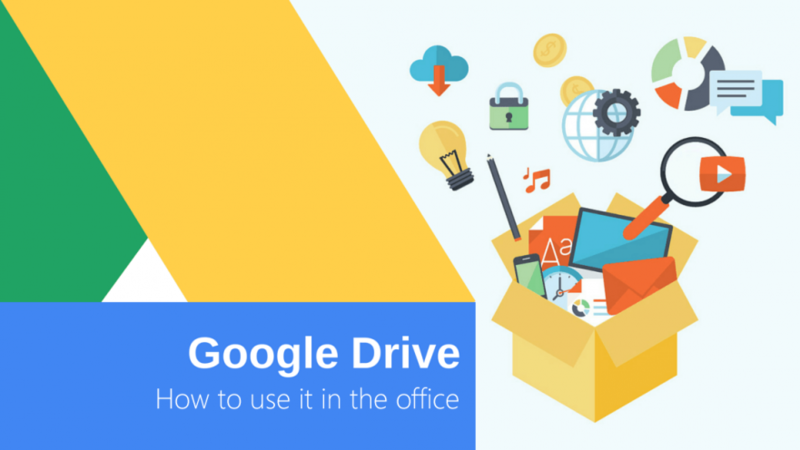 Do you like using Google Drive in the office? Is the spirit of collaboration improved? Give your opinion in the comments.